RETAIL AND ROMANCE: JANE GOES TO THE BALL is a special exhibition highlighting what Jane Austen wrote about the world she knew, and that most definitely included how one behaved at a ball, what one wore and what one ate – the gentry, the gowns and the gossip w ill all be explored in this exhibition. 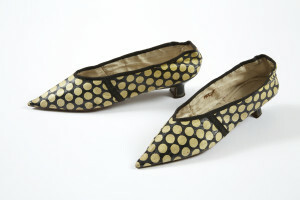 She was an avid consumer herself, and her letters evoke the period with descriptions of what she wore and when. The event is free. For information tel. 01256 463902. On 13 September a special event, JANE AUSTEN: DRESSING FOR THE DANCE will include a brief introduction to the changing fashions of Jane Austen’s day and a walk around the exhibition with Gill Arnott, Curator of Art at Hampshire Cultural. This event has a £5 entry fee. To book call 01256 465902.